This is one of many wildlife exhibits at the new Eugene Nicandri Nature Center in Massena. More than 1,000 people per week are coming to the new Eugene Nicandri Nature Center and officials there are trying to gauge public interest in new program offerings. “Things have been fantastic. People have been loving it,” said Tracy Thomas, the center’s executive director. She said they have been seeing around 150 people daily during the week and 250 to 300 people per day on weekends. She wasn’t involved with the former nature center, but said she believes it’s an uptick from the old facility. “I would say it’s definitely an increase. People are coming out, we’ve got a lot of neat programs. People are curious to see what’s going on. It’s a beautiful building that brings the outside in,” Thomas said. The $7.6 million 10,000 square-foot Nicandri Center was paid for by the New York Power Authority with public money. The old center on the same location burned in 2010. They recently started yoga and may begin trail walking and birding. She said their children’s programs are seeing sizable crowds and they had to expand their pre-school program, Nature Nuts, to accommodate them. Nature Nuts is on Mondays at 10 a.m. and features songs and skits. “It has been hugely popular. We had to expand it,” Thomas said. It has about 40 attendees per week. On Sunday afternoons at 2 p.m., Mark Manske from Adirondack Raptors brings in live birds for demonstrations and talks about their natural history in the region. Thomas said the species vary, but he has recently brought in a variety of owls, including the Eurasian eagle owl, great horned owl and barn owl. They have other daily programs at 10 a.m. and 2 p.m.
“We have some sort of program going on that the public can join in. There’s staff on the floor at all times to point things out, play with the kids or do whatever,” Thomas said. They also have exhibits that people can browse at their leisure. 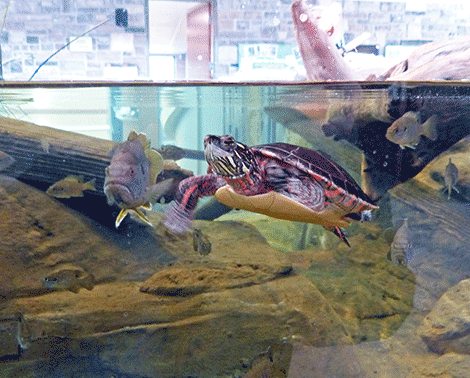 Upon entering, there is a 1,500 gallon tank with fish and frogs, leading into a hands-on exhibit area. There is also a river tank with many local fish species, including lake sturgeon, and other smaller tanks with various land and aquatic creatures. The five miles or so of walking trails remain open. “We’re maintaining them so they are in good shape right now, maybe a little soggy from the rain. They are maintained and ready to go. We have about five miles of trails. Other than being a little wet, it’s been a beautiful summer to get out,” Thomas said. The nature center is at 19 Robinson Bay Road. Their website, with a calendar of events, is at http://www.massenanaturecenter.com/ and their phone number is 315-705-5022. Their Facebook page is at goo.gl/ADGCKa and their email is [email protected].